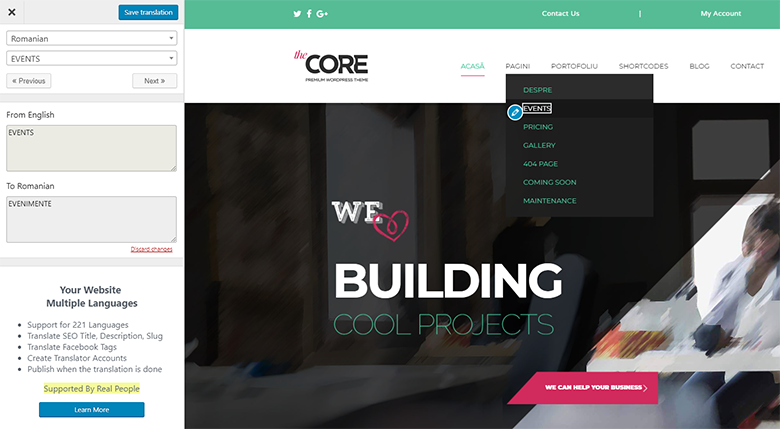 The Core is a powerful multi-purpose theme and the flag-ship product of ThemeFuse. It comes with 23 different websites templates included, built for specific industries, which makes it an excellent fit for any type of business. The theme is powered by the Unyson framework (also a ThemeFuse creation) which is open source and has a great adoption rate among other theme developers, powering more than 100K websites. Being translation-ready, translating The Core theme with the help of TranslatePress is really straight-forward. In this tutorial we’ll go through setting up the theme, installing the required plugins and demo content. Then we’ll install the TranslatePress plugin and start translating every section of the website. 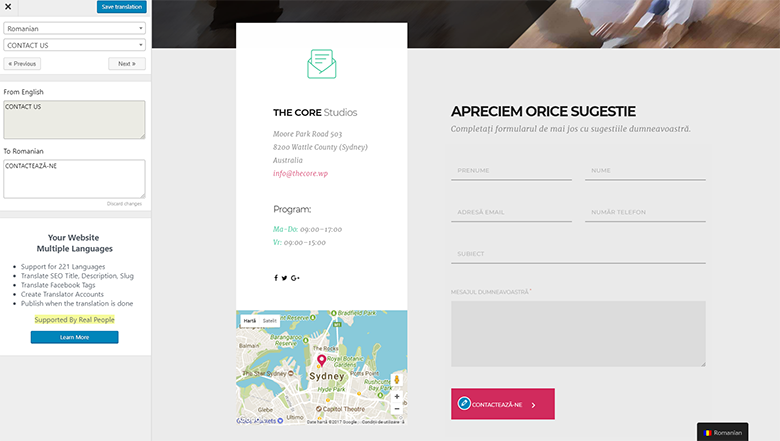 You can download the-core-parent.zip from your ThemeFuse account (or Envato account if you’ve purchased from ThemeForest). 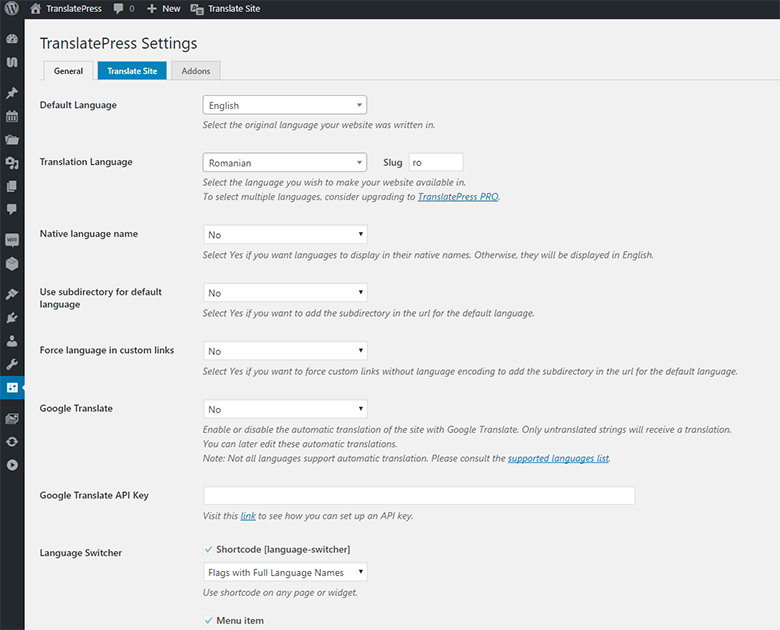 Then in your WP Dashboard, under Appearance > Themes, click Add New and then upload the zip. After installing and activating the theme, you’ll be redirected to the Auto Setup page. For the purpose of this tutorial we’ll choose the first option that installs the required plugins and demo content. 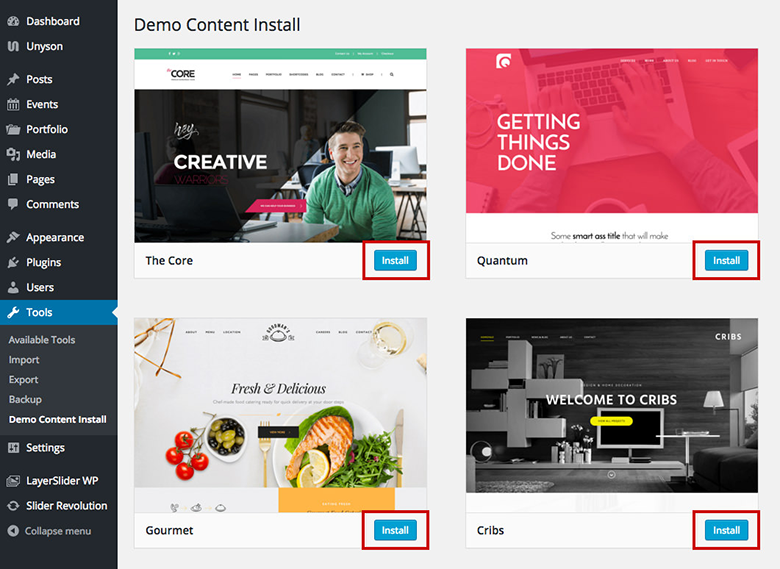 You’ll be redirected to the Demo Content install page, where you can choose what demo content you want to install. We’ll move forward and install the first option: The Core. After this, you’ll be redirected to the front-end and your site should look like in the demo preview. Now that The Core theme has been installed and configured, we can move forward and setup TranslatePress to start translating the site. 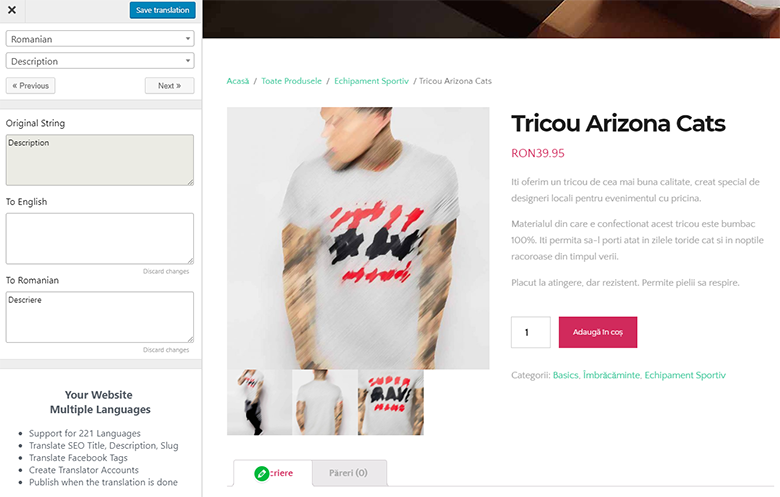 For the purpose of this tutorial we’ll focus on translating some of the main elements like: custom post types (like portfolio or events), menu items, WooCommerce Product pages, contact form etc. Using TranslatePress you’ll be able to easily translate all the remaining content & content types, directly from the front-end, by simply hovering over each string and translating them one by one. The translation interface can be also accessed from the top admin bar. Once opened, simply hover over strings in the right side and translate them one by one. The blue icon strings are user generated (like the page title or the content of a post), while green icon strings are gettext strings from your plugins and theme. Some of the custom post types that The Core theme allows you to create include Events & Portfolio. Moving forward we’ll start translating the Portfolio page and a Portfolio Item. 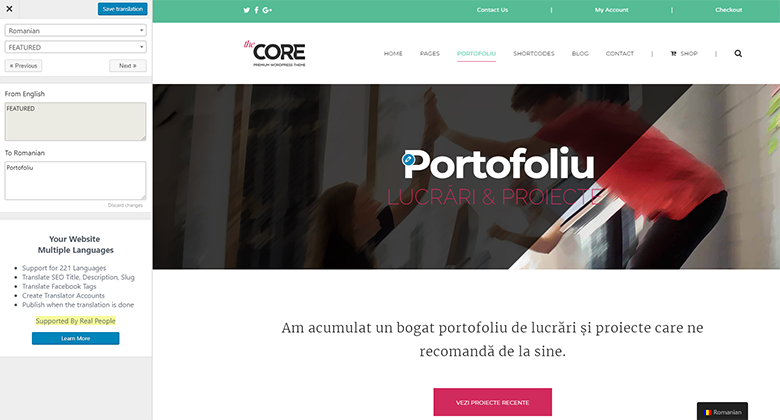 All you need to do is hover over each string from the Portfolio page and click to add their corresponding translation to Romanian. The same goes for translating a portfolio item. You can translate everything, including the call to action button’s text. Using the demo content, The Core will populate a hierarchical/multilevel menu. By hovering over each menu item you’ll be able to translate all of them. Use the same technique to navigate submenus and translate their content as well. The built in contact form can also be translated using TranslatePress. You can translate each form field, labels and submit button. Simply click on the pencil icon to translate each element. The Core theme is WooCommerce ready, allowing you to easily add shopping features to your site. 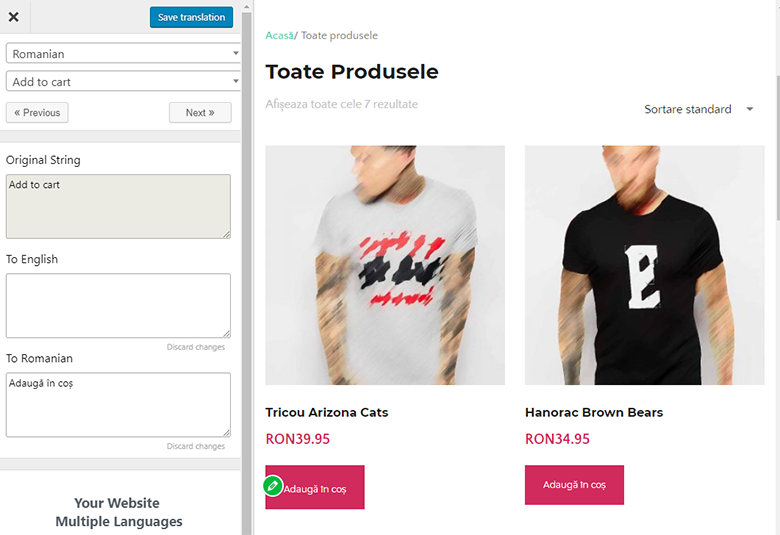 Using TranslatePress you’ll be able to create a multilingual WooCommerce store, by translating all your shop pages and products into another language. Below I translated the main shop page, by simply clicking on the pencil icon and editing all the product strings, buttons, currency etc. Next we’ll move forward and translate the Single Product page. You notice that on some strings (like “Add to Cart” button or “Description” tab) the pencil icon is green (instead of blue), meaning they are gettext strings from a plugin or a theme. In this case, the two I mentioned are added by WooCommerce. Notice how you can also add a different English translation for them? An interesting side-effect of this is that you can use TranslatePress to easily change various strings from your plugins or theme. This was just a quick walk-through on how to translate The Core theme by ThemeFuse. With the help of TranslatePress you can move forward and translate all the remaining content and content types (like pricing pages, team pages, sliders, testimonials etc.). Using TranslatePress with a translation-ready theme like The Core, makes it really easy to translate your entire site into any language. After setting up the theme and adding your custom content, simply add another language and start translating every string on a page, including forms, outputs from shortcodes or page builders. The wide variety of templates included in The Core theme makes it a breeze to pick one suited for your business and by making your site multilingual, you’ll be expanding your audience reach from day one.